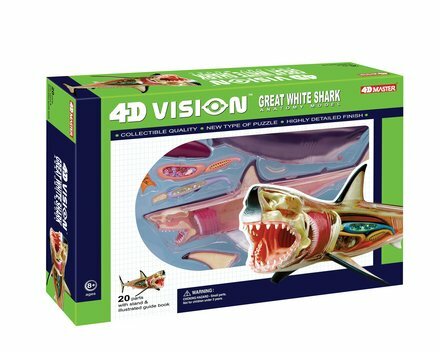 Build your own anatomy model of the great white shark! This exceptionally detailed, 13" model contains 20 detachable, hand-painted organs and parts and a display stand. Also includes illustrated assembly guide, a description of the anatomy, a detailed description of a great white shark’s life cycle, eating habits and size along with some fun Q&A to test your knowledge! A nice addition to curriculum for teaching marine biology or any child's science fair project related to marine biology. Collect the series and have your own animal science museum!